Catalog Home > Mad Mattr®, Green, 10 oz. 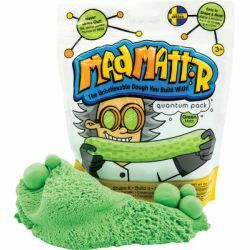 Mad Mattr®, Green, 10 oz. S-t-r-e-t-c-h your creativity to the max with Mad Mattr®- an addictive, super-soft modeling compound that shapes easily. Make whatever comes to mind! Press it, mold it, knead it, stretch it, squeeze it, paint it, sculpt it, float it, sink it, or just pull it slow and watch it flow! Not only is Mad Mattr perfect for relaxing and calming, but it's also great for strengthening fingers, hands, wrists and more. And clean up is a breeze, since it sticks to itself and not to you. Plus, it never dries out no matter how long it is left out. So, it can be used over and over again, providing endless, fun-filled hours of stretchy, open-ended play. Its unique, non-toxic formula is gluten-, casein- and wheat-free, and available in 6 colors that can be mixed together, too!